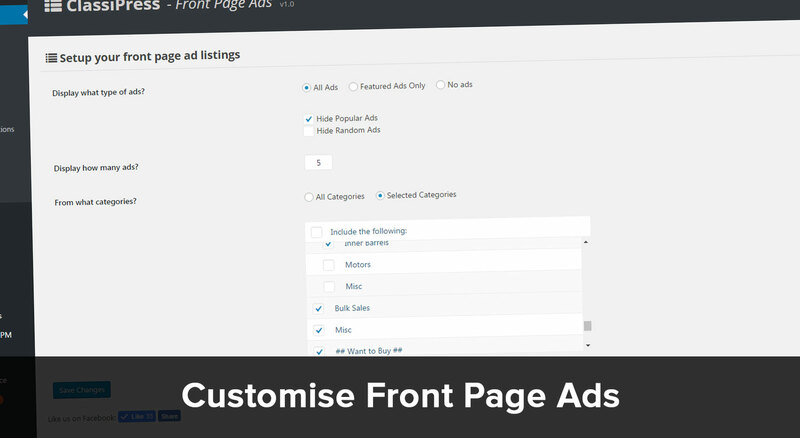 Classipress Front Page ads is a plugin that gives you full control over the adverts displayed on the front page of your Classipress website. 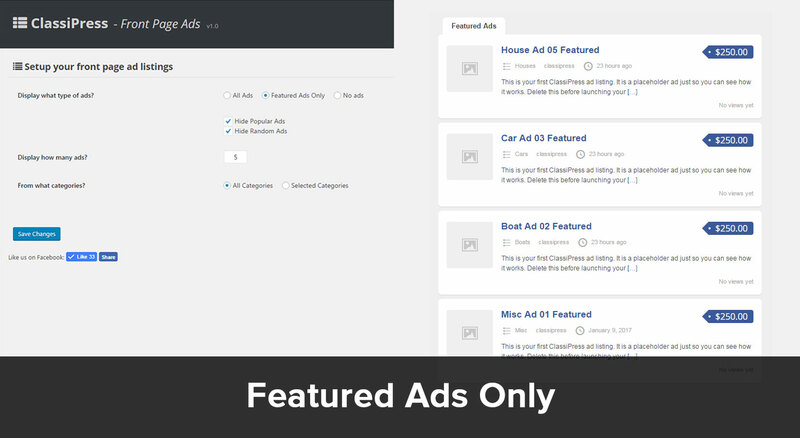 Featured Ads only – This will show only featured ads on your home page. Give higher priority to featured ads and make them more valuable. Only display featured ads on the home page. No Ads – want to remove the latest listing completely? No problem disable it. Hide the popular and random tabs. Don’t want to show the popular tab? Remove it. Hide all ads from the front page. You can disable the ads, and then turn off both tabs to completely hide ads from the front page. Choose how many ads are displayed on the front page. This number is separate from your category archive pages. You can set say 30 ads to show on your home page, but then in the categories only show 10 or whatever your WordPress settings say. Choose what categories you want to display on your home page. 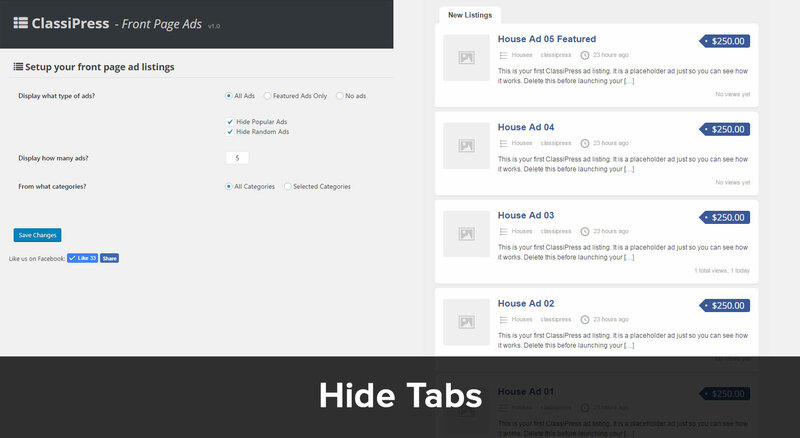 You can choose to only show ads from specific categories on your home page. Perfect if you want to showcase a particular category and those ads over anything else. So as you can see this is some pretty powerful stuff. 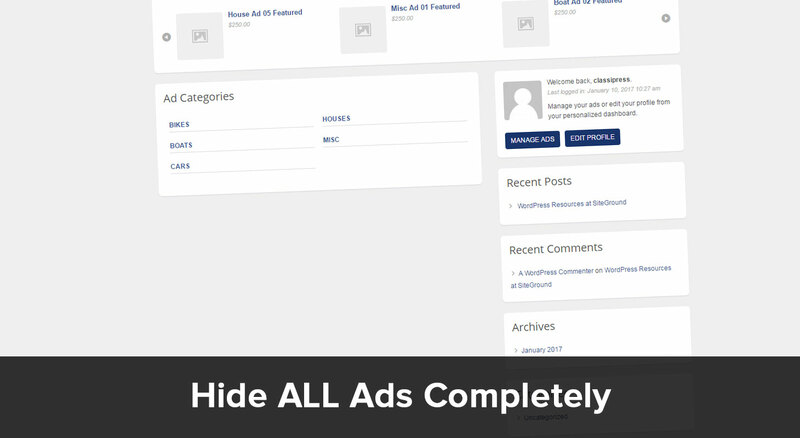 Using this plugin you can choose to only show 5 featured ads from one category on your home page and nothing else. 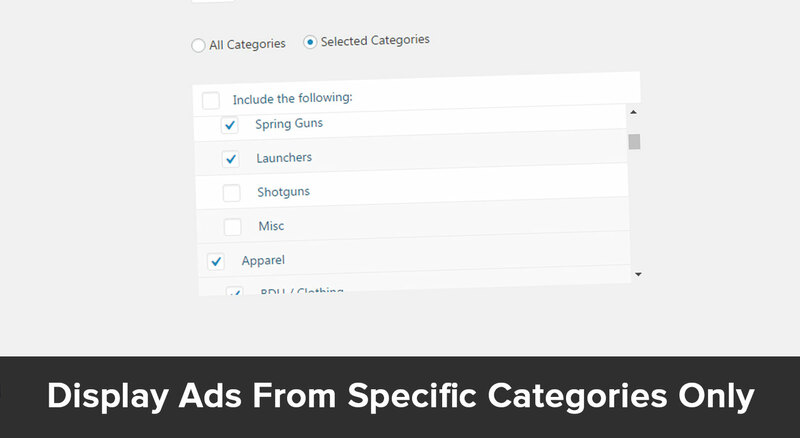 Or you can look to show 20 ads from one category only. Want to show only featured ads from all categories? No problem. Much like the original add loop is, listings will show with the newest at the top. Q. Does this support child themes? A. I cannot guarantee this will work with child themes. I know that Simply Responsive and FlatPress don’t work. If your child theme does not use the default Classipress ads loop for the front page then the plugin will not work. If you are unsure please send me a PM through the forum with your site URL and login details. I will test the plugin on your site and let you know if it works. Q. Does this work with Classipress earlier than 3.5.5? A. No. At version 3.5.5 they made changes to the code. This plugin works with the later versions only. Support is via the plugin sub-forum. If you have any questions or issues please post in here. Direct emails may be missed and not answered as quickly. Thanks. 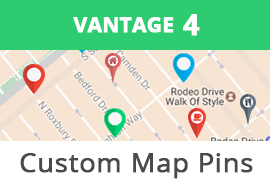 Is it possible to have featured ads + new listings combinations? Featured ads in the first tab. I bought this plugin today and with eclassify it does not work …. As per the FAQ this won’t work on themes that don’t use the default ClassiPress ad loop. You will need to contact AppThemes directly for a refund. Can I create a page and have just featured ads on it as opposed to using the homepage? The same question here as weiching ‘s. Is it possible to replace random ads with featured ads and leave other tabs as are? I’m using ClassiPost which is using a similar functionality as your plugin, the only problem is, if I set the options to display “Recent Ads” only, well, the users have to click on a tab to display those ads, otherwise, the Recent Ads doesn’t load automatically. So my question to you is: Does your plugin behave the same way? If not, do you know if it would be compatible with the ClassiPost childtheme?